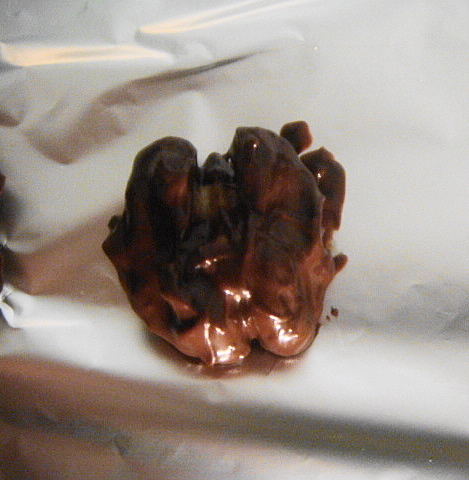 I’ve been experimenting with chocolate and melting it to make candy, pour over ice-cream, dip with muffins and generally just melting chocolate. It’s pretty fun. I do believe I have become a chocolate-pyromaniac. Such happiness while watching chocolate break down and change form. 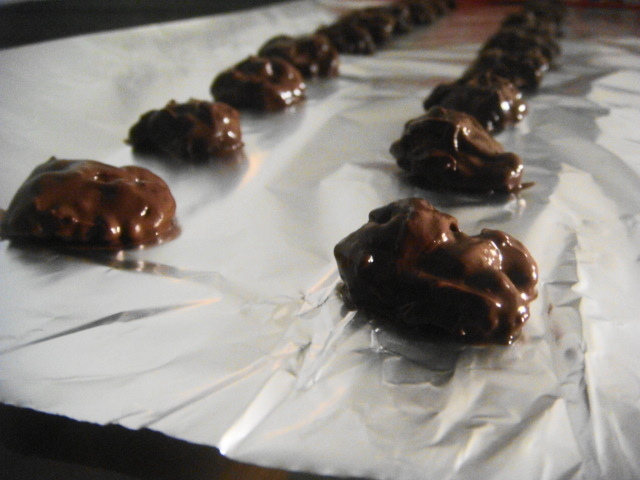 I had half a kilogram of walnuts just sitting in my cupboard, and I figured it was time to coat them in chocolate. I used a cup-and-a-half of walnuts and 1 cup of semi-sweet chocolate. Using an idea from Frugal Feeding’s chocolate truffle recipe, I decided to add some orange zest just to play up the flavours a little. With most nuts that are covered in chocolate, once you bite through the choco-layer the flavour and texture of the nut tends to overplay the cocoa, so I wanted some other flavour to linger. Orange seemed like a tried, tested (and good!) flavouring option. I simply toasted the walnuts, melted the chocolate in my makeshift double boiler and added some orange zest. Then take walnut-dip in chocolate-cool-eat. Toast the walnuts on a tawa or nonstick pan, keep aside. In a double boiler, melt the chocolate and fold in the orange zest and combine evenly. Dip the walnuts in chocolate, cool and allow to set. If you have any leftover orange zest, you can sprinkle a little on each walnut for fun. These were so yummy, and the orange gave it such a kick! I used such a small amount of orange zest, but that lent enormous flavour and a gentle fragrance. As I ate, I was thinking- when the natural stuff can taste so good, why would anyone ever want to use artificial flavouring? I think my next project should be to procure some vanilla pods and make my own vanilla sugar.